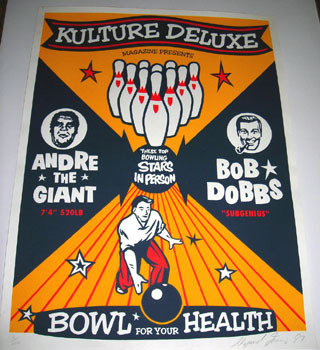 Shepard personally hand pulled all of these prints in 1997 for his friend Rex Darling, publisher of the wildly popular, but short lived San Diego magazine Kulture Deluxe. The run size is the combined total for all 5 different variations of this print. 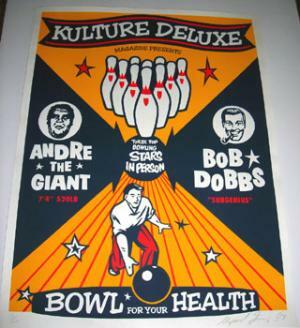 It is thought that fewer than 10 copies of this particular version were printed (red stars, red on pins, red circles around Andre and Bob Dobbs, red pants on bowler). The image was based on the cover of the program for Winter Dance Party. For more information see Bob Dobbs.